From robots that live to love you, to machines that fold your laundry for you, this year’s show has been no exception – even the humble television has had a total reconfiguration thanks to LG’s rollable OLED model that wowed us with its unique mechanical design. One of the biggest announcements from CES 2019 was the new LG Signature Series OLED TV, and while you usually wouldn't expect to find a television on a list of weird gadgets, this one is particularly special. Why? Well, this flexible model features a rollable OLED panel that unfurls at the touch of a button from a base that acts as a storage facility, unfurling mechanism, and a sound system all in one. The TV can either extend to its full 65-inch form, which LG is calling Full View, or display just a small part of the screen in Line View. The latter configuration can be used for playing music, or using LG's Mood Mode, which shows small visual effects to match nature-themed audio soundtracks. Seeing a 65-inch OLED display appear seemingly out of nowhere is certainly a sight to behold, making it one of the most noteworthy TVs we've seen at CES this year. Lovot, the cuddly robot from Japanese robotics startup Groove X, has one mission in life, and that is to make you happy. Designed to behave just like a real living thing, Lovot was made to “nurture people’s capacity to love” by demanding the affection of its owner, and with its big cartoon eyes and teddy bear-soft exterior, it’s bound to make even the iciest of hearts melt just a little. 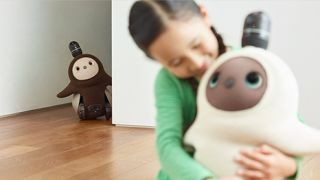 When Lovot wants to be picked up and cuddled, it waves its little arms in the air, and will even follow you around your home on its wheels. It can even ‘fall asleep’ in your arms if you give it a good enough cuddle. With loads of innovative tech packed in beneath its fuzzy exterior, the Lovot certainly doesn't come cheap: you can preorder a pair of the fuzzy bots for an eye-watering 598,000 yen, which works out at around $5,520/£4,320/AU$7,750 based on current conversion rates. There's no doubt about it: doing household chores is a drag. However, the Foldimate laundry folder wants to change this, by making laundry fun. All you have to is manually insert items of clothing into the Foldimate, and about five seconds later, the machine spits them out, perfectly folded and ready to put away. The company estimates that the machine can get through a whole load of laundry in around five minutes. However, convenience comes at a price, and the Foldimate is no exception. While the Foldimate we saw at CES 2019 is still a prototype, the company is hoping for a "late 2019" launch date, priced at an eye-watering $980 (about £770, AU$1370). One of the coolest gadgets we saw at CES 2019 was a plank of wood. No, we're not joking. Shaped like a simple wooden plank, the Mui smart display houses a touch-sensitive interface in the surface of the wood, allowing it to display visual data outputs and touch-control functions like a thermostat, clock, weather information, dimmer controls for your lights, text-based messages or slogans, and even a way to access your voicemail. It even has Google Assistant built in, with the option of having the voice assistant's responses displayed in text on the display or read aloud. If toilets could talk, what would they say? Whether you want to know the answer to that question or not, the Numi 2.0 Intelligent Toilet from Kohler does just that, with high quality speakers that allow you to converse with Amazon's Alexa as you...do your business. The super smart toilet also allows you to activate the heated seat, a 'personal dryer', and even ambient lighting and music to set the mood for your toilet trip. For this luxurious lavatory, you'll need to part with a hefty $7,000 (around £5,500 / AU$9,750). For that money, we think we might just stick to our less talkative toilet after all.